Old Tower is a small fort in eastern Bangkorai, southeast of Bangkorai Garrison. 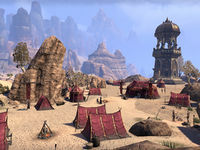 The tower was a border post of the Daggerfall Covenant until it was taken over by the Second Cohort of the Imperial Seventh Legion, who have also taken control of the nearby border crossing at The Gates of Craglorn. Old Tower Objective: Thwart the Seventh Legion at Old Tower. A Handful of Stolen Dreams: Recover some family heirlooms for a group of Evermore refugees. A Token Trophy: Help an injured scout rally the Covenant against the Seventh Legion at the Old Tower. Scavenging for a Scarab: Help an old spy falsify the Seventh Legion's orders. 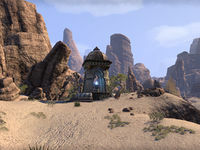 Old Tower Wayshrine is located far to the southwest of the tower, southeast of Damar Farmstead and north of Klathzgar. This page was last modified on 19 November 2018, at 05:48.